Two Southern Illinois University Edwardsville School of Engineering students are among eight in the country participating in Levi, Ray & Shoup, Inc.’s (LRS) competitive internship program this summer. Located in Springfield, LRS is a global company offering a wide range of computer software products to customers around the globe. 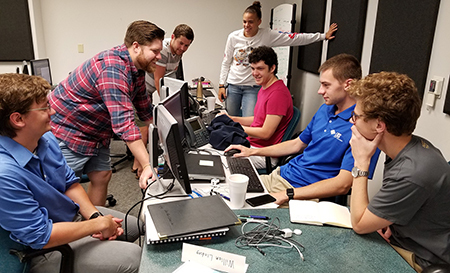 Through the company’s internship program, SIUE senior computer science majors Lyric Boone, of Rochester, and Spencer Lemay, of Belleville, are gaining hands-on experience in software development, support and systems engineering. Lemay learned of the internship opportunity through one of the SIUE Career Development Center’s Interview Days. Boone was connected by SIUE Women’s Basketball Head Coach Paula Buscher. According to LRS, the goal of its unique internship program is to offer college students more than a chance to “shadow” professionals. Program developer John Runions, director, North America Systems Engineering and Business Development, wanted to give interns an opportunity to learn about the development, support and systems engineering roles at LRS, and an introduction to the company’s culture. “The culture at LRS makes me excited to finish my degree and put it to use,” added Lemay. Photo: In the LRS training room that has become their office, members of the internship program discuss their work. From left to right are Dryden Steele, Jordan Shifflett, Danny Munson, Lyric Boone, Josh Matchuny, Will Lindsey and Alex Cawley. Spencer Lemay was unavailable for the photo.